English Braids is a UK manufacturer of synthetic ropes & braided cords. Our products have been used for over 50 years in a wide range of applications including marine, lifting, engineering, commercial winching, entertainment & manufacturing. We use the highest quality yarns, modern machinery and a stringent quality control process. 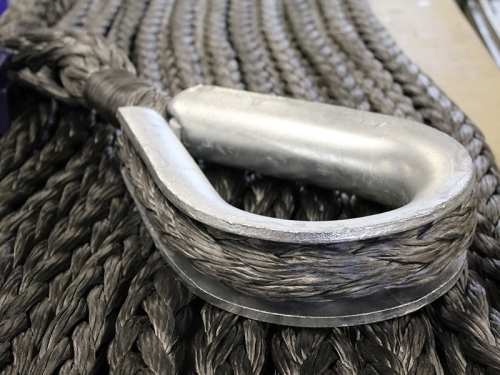 As a UK Dyneema® partner and manufacturer of ropes in the UK. Dyneema® forms part of the business overall strategic direction which is aligned to technical products delivered with first class customer service. Developed by DSM some 30 years ago and known as the world’s strongest, lightest fibre – 15 times stronger than steel, yet floats on water – Dyneema® works to stop bullets, repair human joints and improve the longevity of apparel. In addition, our Tutus static rope is an EN 1891 low stretch kermantel ropes with high strength for use in rope access, fall safety systems, rescue and caving with a high proportion of sheath to cover ratio which provides improved abrasion protection & reduced sheath slippage. Come and meet our experts on our stand at Liftex to find out more about our exciting developments and new products on offer. We can also discuss any specific requirements you may have.